When you have young children, there are many ways to start them in an outdoor playtime habit that will last their lifetime. Of course. they require more supervision than an older elementary school age child. So, you will need to b more hands on with their outside activities, it is a good thing that being outdoors is healthy for adults too. Here are some tips for parents on getting your 6-months to 3-year-old baby outside playing. When looking for outdoor play toys, choose wisely. Toys like swing sets and cubby houses are ones that should last a lifetime. We recognize this at CubbyKraft and pay close attention to how we can help kids get the most out of their outdoor play toys. For instance, we have infant seat swings that you can use on our swing sets and then switch them out to a molded swing or a back-to-back when your child gets older – or you want to make room for more kids playing at the same time. It’s a big deal for little ones to play a game and then play it again – over and over and over. That is how they learn at this stage, repetition. So, while it may bore you a bit, try and hang in there moms and dads! One that your baby is sure to love is playing peek-a-boo when they are swinging or looking out of the window of their cubby. It really sets off the giggles when you child pops their head up to look out their cubby window and they see you there! Pay attention to your child’s signals. Do they love play in the sand pit drawing in the sand or putting sand into a bucket only to dump it out again? Great! Let them go at it. Do they prefer swinging or playing with blocks in their cubby house? That is good too. Young children may want to do something until they feel that they have mastered it, then they move on to the next thing. So, let them let you know what they are in the mood to play with, and learn, each time they go outside. When showing your little one how to use an outdoor toy or how to play an outdoor game, go slowly. Remember, they are really new at this. You will want them to understand how to do things and, almost more importantly, how to do them safely. Involve siblings and other children. Even when kids are playing separately, but in the same space, they are learning from each other and enjoying each other’s company. The Kookaburra Loft cubby house is a fun outdoor play toy that your child is going to love playing in so much; you will have a hard time getting them back inside! This is a place that children can have all to themselves, their own little world right in their own back yard. A fun world in which they can invite their friends and neighbors to come play with them. 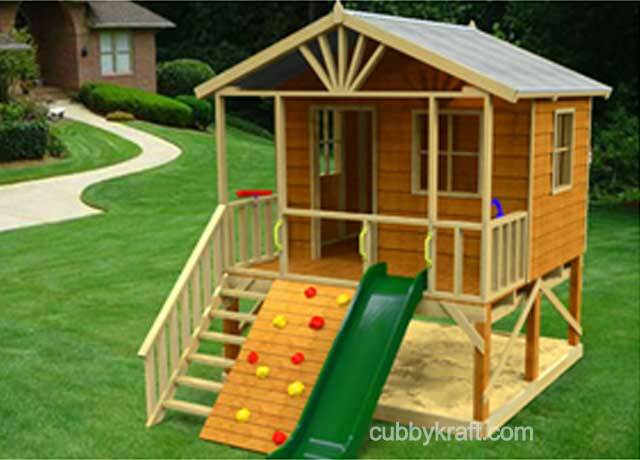 Cubby houses make for awesome play dates and enjoyable social interactions for kids.